Archos has just revealed its latest Android tablet known as the Archos 80 Xenon. While Archos may not have made it big in the tablet market despite the slew of tablets that it has released, the Archos 80 Xenon tablet by virtue of its affordability looks appealing after all.It is said to be a Google-certified tablet with some decent features that may appeal to the budget-conscious who are scouting for a new Android tablet to purchase. But is price enough for you to consider getting the Archos 80 Xenon tablet? 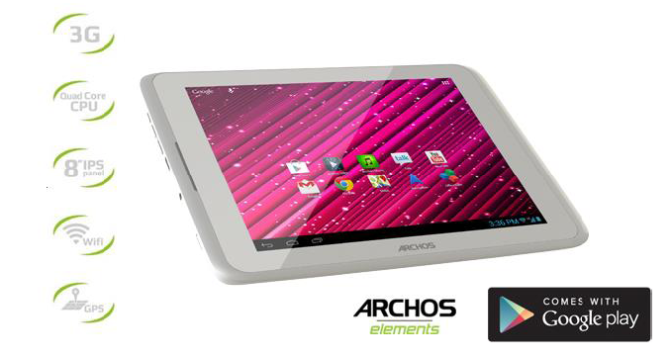 Archos 80 Xenon tablet, anyone? A quick look at the Archos 80 Xenon tablet will tell you that it is gunning for the tablet space currently owned by the iPad Mini. The tablet has an 8-inch 1024×768 IPS multi-touch screen with 4:3 aspect ratio. Archos claims that this is enough to deliver amazing vivid colors and impressive wide viewing angles. But that is of course is yet to be proven. Additionally, It is loaded with a Qualcom 1.2GHz quad-core processor which is possibly of the Snapdragon S4 kind.There’s also 1GB of RAM for peformance boost, 2MP back-facing camera and expandable MicroSD slot. The 80 Xenon tablet comes with 3G wireless broadband feature for continous wireless mobile connectivity. Archos said that it can be used with any SIM operators worldwide since it is an “un-SIM-locked” device. This means that it can accept SIM cards from any operator even pay-as-you-go SIM cards. The tablet also features aGPS combined with Google Maps and Google Maps with Navigation beta that gives you quick access to maps and directions. Archos also threw in a couple of its Media Center apps including metadata scrapping, auto-subtitles, wireless media sharing and best format and codec support. For its OS, the tablet runs on an unskiined Android 4.1 Jelly Bean which is optimized for a smooth UI experience as well as Google Voice assistance. Then there’s also a full suite of Google mobile apps including Gmail Google Talk, Google+, Google Maps and Google Drive. While the Archos 80 Xenon tablet may not appeal to most of you, you might still want to consider buying it especially if you’re in a tight budget. That’s because the tablet will be retailing for $199 when it comes out sometime in June 2013. So, will you be taking look at the Archos 80 Xenon tablet when it comes out? Are its specs and features truly worthy of its price? Share us your thoughts, folks.